#415 And I forgot my camera ! It had been cloudy and threatening to rain all day but at 6 pm the skies started to clear and the conditions mellowed. 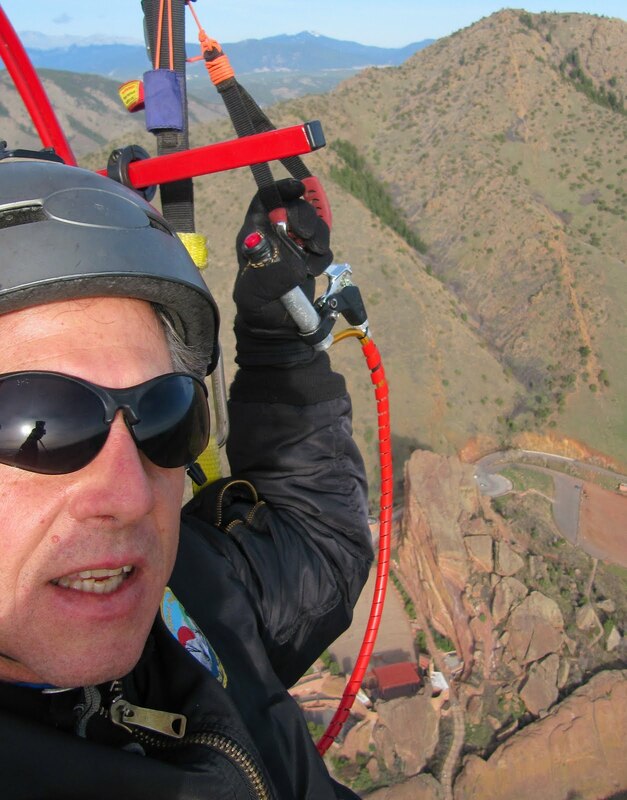 While I was watching, Marek called and we both agreed that it was probably going to be flyable. Marek could not go but it looked good and was certainly better than sitting around feeling sorry for myself so I jumped in the MR-2 and raced over to Chips house. In record time I was at Simms and launched quickly without incident. As predicted … it was glass. 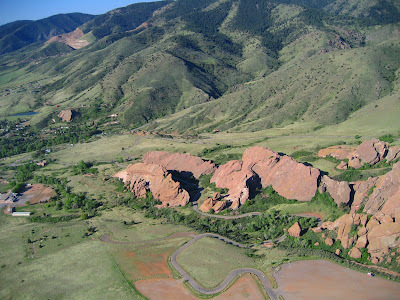 I flew straight toward Red Rocks and as I came over the hogback I could see that there was a concert tonight. 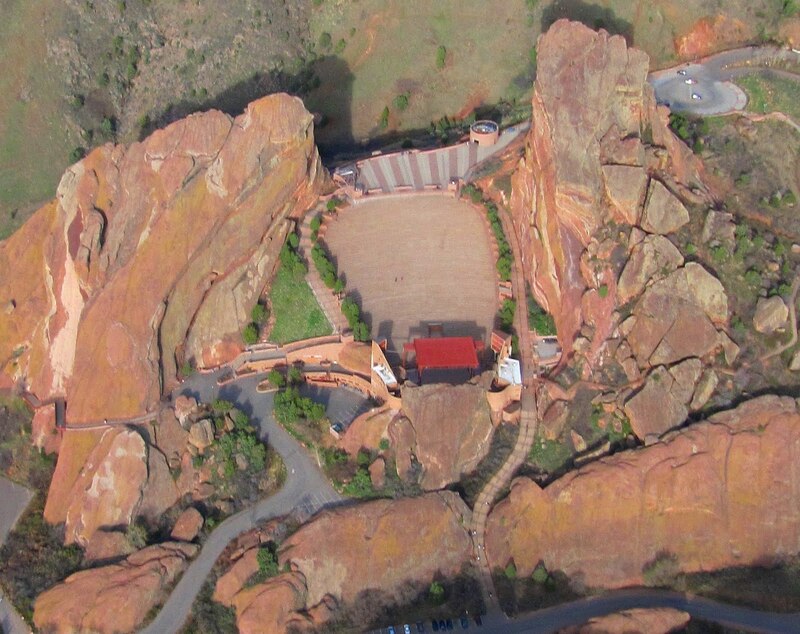 I flew the perimeter of the Amphitheater about 800 feet above the crowd being careful not to overfly the congestion. Damn I forgot the camera! BUT from all the flashbulbs going off I knew that there were hundreds of photos being taken so the flight was documented (if not by me). From the west I could look right over the seating into the stage where they were doing light and sound checks. Perhaps 2/3’s of the seats were filled with lots more coming. After a couple of circuits around the park I headed east, as I was halfway to the hogback I noticed a strange craft to the south. At first I thought it was a balloon but within 10 seconds I could tell it was moving toward me and no balloon. It was coming straight at me and at about 3000 yards I decided to wag my wings and turn back to the Amphitheater. 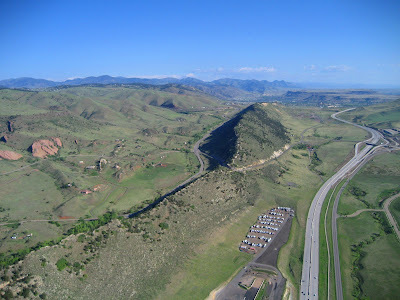 I did a small wingover and just as I began to turn west it must have seen me because it made a hard turn to the east and descended rapidly to 500 feet below me. 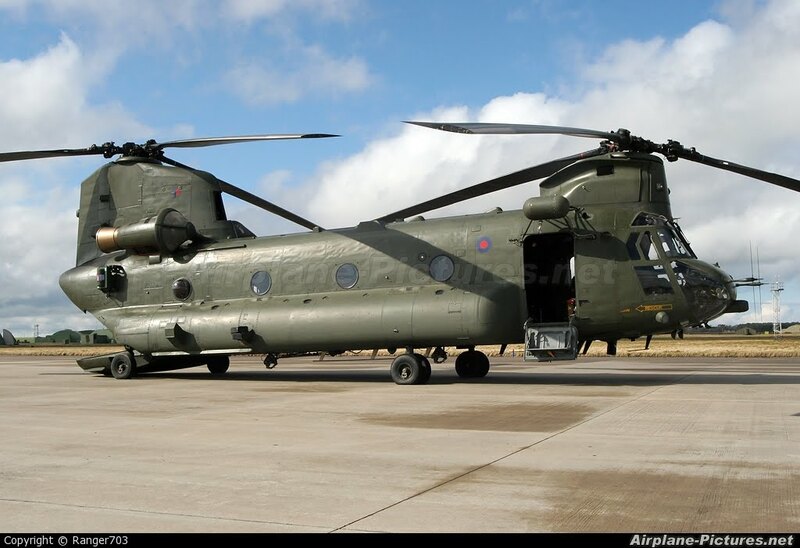 When it turned and I could see the profile, I was surprised to see that it was Chinook cargo copter. I’m glad he saw me when he did … I’m sure they throw a monster propwash… not something I ever want to experience. Author JoeOPosted on June 4, 2010 March 28, 2017 Categories aircraft in area, Red RocksLeave a comment on #415 And I forgot my camera ! Good to get back to Red Rocks. Nothing special to report, air was calm except at the drainage from the Hwy 285 cut. It was drizzling while I loaded the truck at 5:15am. There was a low cloud cover 0n the North and Eastern horizon and patches of virga over Lakewood. I checked out the Lucent site and was just about to unload when a puff came out of the south and spoiled the moment. One morning it’s going to be coming out of the east or north and I’m going to try this place out! Today I didn’t have any GPS so I couldn’t tell what the climb rate was …but it felt just fine…I might be making a fuss over nothing but I think it would be a safer machine if I could levitate a little faster. 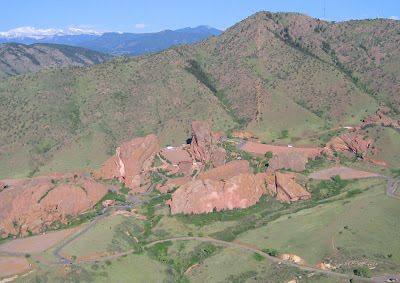 There was very little wind and the clouds had mostly moved to the East so I took the opportunity to fly over to Red Rocks Amptheather. It was a beautiful flight, clear and light in the west and cloudy and dark behind me. The sun had just started to peak thru as I was approaching the hogbacks …great light for photography…and lots of lift. After circling the theater and taking a few pictures I flew back toward the golf course and used the lift band at the dam to get a bounce. Probably the best air I’ve experienced in a long long time. The descent took a good long while and I worked hard to position the buggy for a long final approach. Finally I was able to run 500 yards to the truck just a few feet up and touch down light as a feather exactly where I wanted. It was nice to get a little fine control I’m even getting a better feel for the throttle. If I have the room to maneuver this machine puts out plenty of power, it’s only where I’m working in tight quarters that I get puckered up. Today I used the 26 meter wing and boy … it took forever to run it up to take-off speed…I almost took out Chip’s wind sock ! 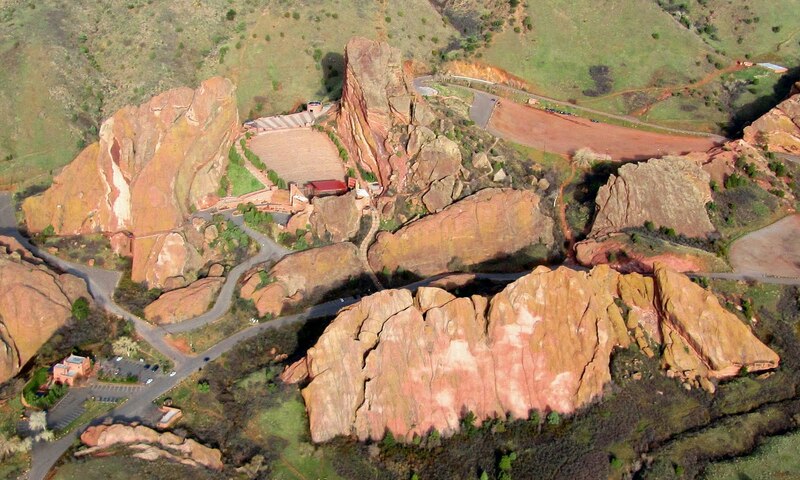 I flew to Red rocks but chickened out when it started to get bumpy…Sound familiar? I wasn’t able to climb nearly as fast as the other day probably because of the smaller wing but there were also areas of sinking and lifting air which spooked me. These fins run South below the ampitheater and they look like fun!